In 1984, coinciding with the 100th anniversary of Tesla's arrival in the U.S., a group of highly dedicated people organized the first Nikola Tesla Symposium in Colorado Springs. Speakers included Marc Seifer, J. & K. Corum, Oliver Nichelson, Moray B. King, Tom Bearden, and Andrija Puharich. A number of excellent papers on various aspects of Dr. Tesla's work in electrical engineering were presented. The book includes a bonus paper written by Tesla himself in 1937 on the particle beam device. 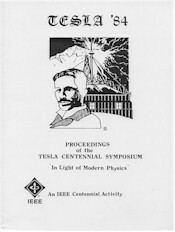 Click here for a list of published papers from the 1984 Tesla Centennial Symposium.